There is not a recognized specialty in dental implants. Therefore, no dentist can actually be a dental implant specialist. However, some dentists have had so much advanced post-graduate training, they are dental implant specialists in all but the non-existent title. Dr. Burba is one of those dentists. He’s been through the 3i Institute for Implant and Reconstructive Dentistry (IIRD) courses and has extensive experience and expertise in this clinical area. 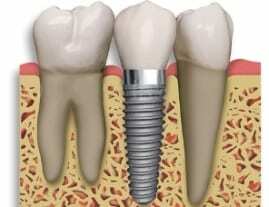 Why do you need a dental implant specialist? 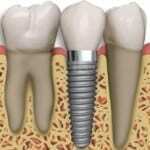 Dental Implants are an excellent way to replace your missing teeth. As you can see in the picture, the implant takes the place of your tooth root, providing a stable base for your implant crown. It is also effective in preventing facial collapse. To learn more about this procedure, you can read about it on our dental implants page. The reason you want someone with expertise to do your dental implants is to prevent complications. Do a quick Internet search on dental implant horror stories and you can read some of the disasters. There have been dental implants so improperly placed, a second dentist had to remove them, graft new bone, let it heal, and then completely re-do the procedure from the beginning. Implants have been placed in the nose and sinuses, impinging on nerves, and protruding out the side of the jawbone. Aside from misplaced implants, there is a risk of failure from infection and poor bone density. In any surgical procedure there is a risk of infection even if everything is done properly, but incorrect actions on the part of the dentist or oral surgeon can cause problems as well. Additionally, if the dentist places the implant when your jawbone isn’t built up enough, your implant will come loose and fall out. Not all dentists can do the bone grafting procedure necessary to build up the jawbone of patient’s suffering from facial collapse. However, Dr. Burba and his surgical team can. This gives you a chance at a real smile and the ability to eat well again. If you’re interested in getting dental implants, you may call our office to schedule an appointment or click here to request an appointment online.